Since summer has begun, to my delight and my partner’s chagrin, our little courtyard has been filled with spiders. Although they are taking up a lot of space on my washing line, I am reluctant to deprive them of the beautiful homes that they have built for themselves. 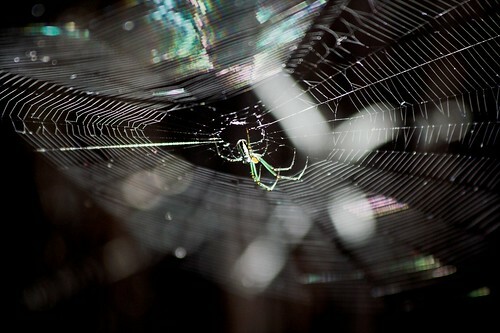 Photos below the fold, for those who would rather not be confronted with images of arachnids. For those who are curious about such things, these photos were taken with a Canon 350D dSLR, using a Canon EF 70-300mm f/4-5.6 IS USM lens. They were taken in RAW format and processed using Raw Shooter Essentials 2006. If anyone else has some photos that they’d like to share, link to them in comments, and if possible, I will work teh admin magic to make them appear! 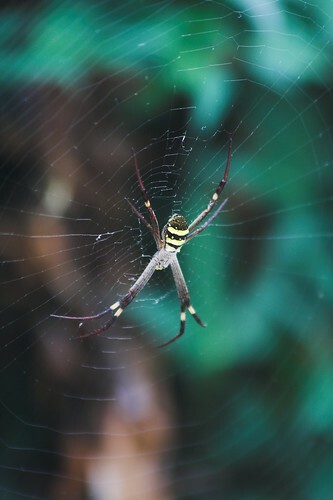 Ah, I’m rather a fan of the St Andrews Cross spider and the clever way they weave. Nice shots. I’ve been evicting huntsmans, or in some cases failing to evict them and then deciding that if I can’t see the enormous one that just went behind the book case in the bedroom then it isn’t really there. Oh, and I meant to say – I love spiderwebs with the morning dew on them. Especially the ones not built across my front path. We have a truce with the one near our front stairs. We will only break supporting strands that cross the main part of the stairs. She used to live downstairs, but she relocated, leaving the sucked dry husk of her lover behind. Haha, Merryn — unfortunately, my partner is too squeamish around spiders to form such a truce indoors, so I usually end up removing them. There was a small spider that lived in our bathroom for a while, however, that he was willing to tolerate it. We called it the zombie spider because every time we thought it was dead, it came back to life for a little bit. That first one looks like a Silver Orb Weaver (gen Leucauge) – beautiful spiders and not too common down here in Adelaide; not sure where you’re from. Spiders pop up in the oddest of places. We have a number of Long-jawed spiders (gen Tetragnatha) living under the metal rim of our above-ground swimming pool! When we are in and splashing around, they retreat to the highest possible spot and then come out again when leave. I wondered intially what they would get to eat under there and then I realised: lots and lots of mozzies! I am in the Barossa Valley and we get plenty of large huntsmen and recently also had a large male trapdoor spider wander inside – I have attached a photo and no doubt done it wrong, so some Admin majik there would also be appreciated. He wandered in after one long night of thunderstorms and didn’t look too clever; sure enough, by the next evening he was deceased. Thanks for sharing your spider stories!